Former PM participates in wedding of daughter of former deputy killed in a car accident, whose family Olmert since took under his wing. 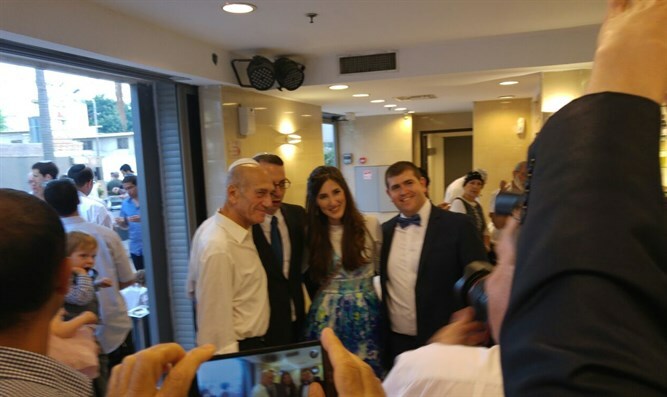 Former Prime Minister Ehud Olmert arrived to Bnei Brak to participate in the wedding of the daughter of the late Shmuel (Shmulik) Meir. Meir served as a member of the Jerusalem City Council and Olmert’s Deputy during Olmert’s service as Mayor of Jerusalem. The two were very close friends. Meir, a rising star in the National Religious Party, was hit by a car driven by an Arab and killed near the community of Adam in the Binyamin region in1996. He left a wife and eight children. From then on, Olmert would visit the family almost weekly on Friday at their home in the Kiryat Moshe neighborhood of Jerusalem, even bringing them fresh challah for Shabbat, and maintained a continuous connection with them.